Kate’s interest in music began with clarinet lessons whilst at primary school in Northamptonshire, where she later played in local wind bands and the Kettering Symphony Orchestra. 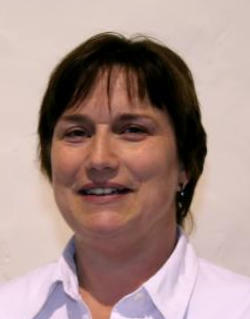 She was also involved in music education, working for the Northamptonshire Music Schools. Since moving to Kent, Kate has played with several local wind bands and has been involved in a number of chamber groups performing at local venues including the Gulbenkian and Marlowe theatres in Canterbury. Kate also teaches clarinet, piano and music theory to both children and adults. She recently completed her BMus (Hons) at Canterbury Christ Church University, studying clarinet with world-renowned clarinettist, David Campbell; and conducting and orchestration with Dr Paul Edlin. Simon began learning the flute from age 8 and shortly after joined his local town band where he moved up through the sections to eventually become assistant conductor. He was 13 when he first conducted in a concert and then began taking on more responsibility; conducting the band for rehearsals and summer fete engagements. Simon then read Chemistry at Liverpool University and successfully auditioned to conduct the University Wind Orchestra for two years, which included a concert in the Metropolitan Cathedral. He then spent a year in Harlow, Essex where he joined Harlow Town Band playing on a first flute desk and conducting the band in warm-ups and sectional rehearsals. In 2003, along with Jules Prosser, he co-founded the Pfizer Wind Orchestra and continued with them when they reformed as the Sandwich Concert Band. Simon has attended several conducting courses including the international Canford Summer School of Music where he received tuition from wind band experts and conductors Tim Reynish and Mark Heron and was selected to conduct the Symphonic Wind Band in the end-of-course concert. He was also successful in gaining a place on a short conducting course held at the Royal Northern College of Music in Manchester. In January 2012 Simon relocated to Yorkshire to take up a new job in Leeds. We were very sorry to see him go. He gave so much to the band over the years, in terms of time, energy and commitment; and we all wished him, his wife, Gillian, and son, Oliver all the best in their new life ‘up north’. 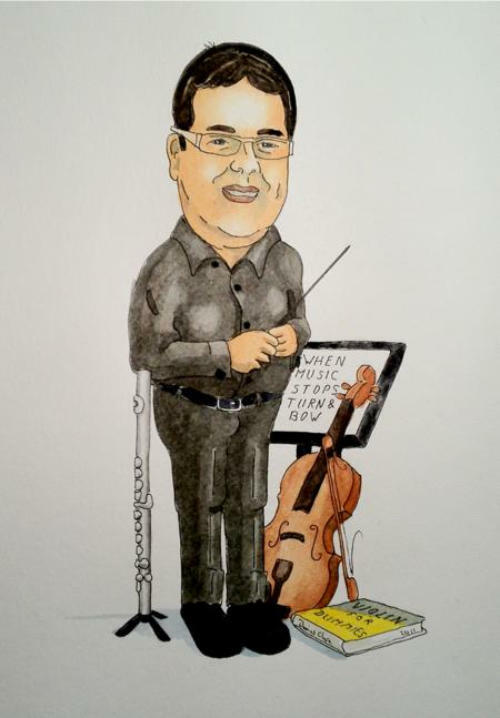 Following his final concert, he was presented with a caricture drawn by David Clare (right) and a rendition of Ilkley Moor Bah Tat by the brass section. The band is continuing to play, and Simon joined us as guest conductor at our 2012 summer barbecue. After a short break, Benedict returned in April 2015 as conductor for the Concert Band. . 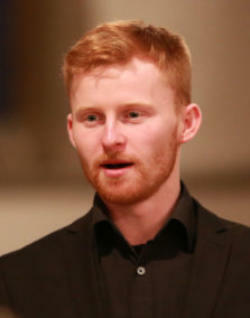 Sandwich Concert Band in Setember 2014 were pleased to announce the engagement of their new conductor for the Concert Band: Ben Lunn is a composer and conductor based in Ramsgate. He studied composition at the Royal Welsh College of Music and Drama, and was taught composition by Peter Reynolds and taught conducting by Dr. John Traill. Ben graduated in July 2014 with 1st Class Honours and the Composition Prize. Ben has conducted a variety of groups from orchestra and choir to chamber ensembles. Other interests outside of music include, reading literature and poetry and a keen interest in art. Our first rehearsal with Ben was on 10th September after the summer break. In March 2015 , Ben conducted his last concert with us as he resigned to pursue other musical ventures. We wish him well for the future and thank him for his dedication and time over the past months. 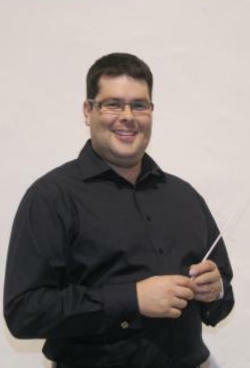 Benedict Preece is principally a conductor, passionate about working with both singers and instrumentalists. He is currently Music Director of Caritas Chamber Choir, East Bridge Chorale and Sandwich Concert Band and has recently been appointed Genesis Sixteen Conducting Scholar 2017/18. He began his career as a Chorister of Canterbury Cathedral and continues to sing in the choir as a Deputy Tenor Lay Clerk. At Trinity College of Music, London, he specialised in horn and natural horn under tutelage of Roger Montgomery and subsequently with Anthony Halstead. As an organist, Benedict studied with Dr. David Flood and both organ and composition with Neil Wright. A keen composer, many of his choral works are performed by Caritas and choirs from Sweden, the Netherlands and the USA with whom he has developed strong links. Benedict has developed his orchestral conducting technique with Stephen Portman (a former student of Monteux and Szell) and on Peter Stark’s renowned courses. He maintains a busy schedule with all his ensembles. Caritas Chamber Choir is regularly engaged to deputise for Canterbury Cathedral Choir in holiday times, singing 25 services as well as 13 concerts, raising funds for a variety of charities. Recent performances have taken place in Lille Cathedral, the Netherlands, and in October he has been invited to conduct in Madrid, followed by a tour to Sweden (with Hagamotettkör) in the Spring. However, before this, he will direct the first Caritas International Young Composer Competition final at the Colyer Ferguson Hall. There are significant prizes to support young talent, which attracted entries from three continents. The renowned US composer, David Conte, will adjudicate the final in July. In the next year, Benedict will also direct exciting collaborations with Canterbury’s Festival Chamber Orchestra and Kent Sinfonia.